I am proud to say that I am from Georgia, but as most people from my state, they migrated there from another state. I was born on August 27, 1982 in Belvelle, New Jersey and moved to Atlanta at the age of 5. All three boys of our family were born pretty much a year apart. This was a determinant factor in my vocation because often we would not only fight as brothers but share common dreams and goals. As the second of three children, I am proud to represent the best of the family. My older brother is also a Legionary priest and in fact was ordained together with me on the same day. 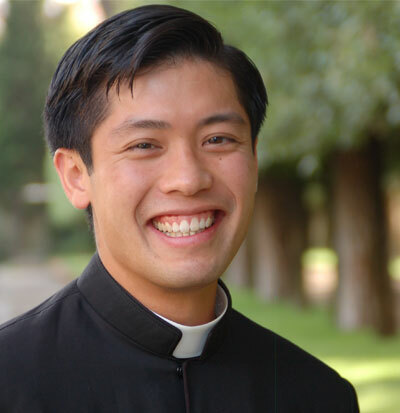 My father is a permanent deacon for the Vietnamese community in diocese of Atlanta and my younger brother currently works as the director of youth programs in the diocese of Atlanta. My joyful mother continues to teach pre-Kindergarten at Pinecrest Academy in Atlanta, Georgia. Growing up I was a pretty vain kid (and probably still am) and had difficulty fitting in with the boys my age. I always wanted to do the things they’d do such as playing sports and going to parties but our family situation was a little bit different. We had a mix upbringing from Vietnamese to American culture and a Catholic to secular mindset. I went to mass everyday and prayed the rosary but as well attended public school with not so good of an environment. I had some Vietnamese friends but only hung around the ones that were more American. This led to tensions between my parents and me. Under this context I was rebellious and had somewhat of an attitude as a boy. However, little did I know, it was God protecting me from other dangers. Both my parents had escaped from Vietnam at the end of the war in 1975. When I was younger that was literally all I that I knew of my parents’ past. Only later did I find out at my junior year in high school, that my father helped as a medic in the South Vietnamese Navy. After watching some of his comrades died in the war, he was able to escape with his fleet to some American bases found in islands of the Pacific. My mother on the other hand was sent off by her parents with her two sisters and her younger brother to flee from the oncoming communist regime eminent to seize power over country. In her escape she formed part of the famous boats-people that suffered many loses in the tossing seas of Southeastern Asia. Only three years ago was I able to return to walk the sandy beaches where my mother and so many others fled the war searching for safety. She credits her safe arrival to the United States to the intercession of the Blessed Mother as she still has with her today the same statue she had in her hands the day of her escape. However not knowing any of my real past, I remained just as hyper and rebellious as usual. Don’t get me wrong but I did have an enjoyable childhood. Things started to accelerate for me at age twelve when the idea of the vocation was presented to me. Two Legionary priests came by my house to do a presentation on the Legionary minor seminary. I was very impressed so my older and I went to visit it that same year and did we have a blast! Seeing the other boys I felt identified to what they were doing and who they were. I decided to join the following year. To tell you the truth the year before I entered was a year full of surprises. I was making new friends and went to lots of fun outings with them throughout the year. As the time came close to join the Apostolic School I had doubts of whether I should go or not. With the help of my parents and the simple prayer life I had, I made a simple yet determinant decision to give it a shot. Life in the Apostolic School was great but as always, difficulties started to present themselves. Over the years the activities at the school were always fun but you would get use to the same rhythm. Another difficulty that presented itself was that some of my good friends there decided this isn’t there path in the vocation and you start to really think whether it is for you or not. I still remember at the end of my junior year in high-school while the other guys were out on free-time, I decided to go make a visit in the chapel. I remember staying there for some 30 minutes or so and made a serious commitment to follow our Lord from that day on out and do what he asks out of me. I thank the school for teaching me how to see Jesus and Mary as real people and forming in me strong habits in life. From the day I entered into the novitiate in 1999 to today, I still have one factor that allows me to move forward: God’s providence, His loving hand in my life. In these 13 years of formation I have been meditating on how God has always been there for me not only in my life but the lives of those who have anything to do with me. It was during these years I saw my father be ordained a deacon. It was in those years I went back to Vietnam for the first time with another priest to find the rest of my lost family. It was in those years I’ve seen many of my comrades choose another path in their vocation. Truly, it was in those years I discovered God’s loving hand guiding me to where I am today. Thank you oh Lord and I pray to follow you where you will it. Amen. Fr. Jason Huynh, L.C., was born on August 27, 1982 and was the second of Hung and Mythi Huynh’s three children. He attended Peachtree elementary school and Pinecrest Academy in Atlanta Georgia before entering into the Legionary of Christ as an Apostolic in Center Harbor, New Hampshire. He entered into the novitiate in 1999 and made his first profession in 2001 in Monterrey, Mexico. He earned his bachelor’s degree in philosophy in 2004, his master’s in philosophy in 2009 and his bachelor’s degree in theology in 2012 at the Pontifical Regina Apostolorum College in Rome. Between his philosophical and theological studies, Fr. Jason spent three years doing as the dean of the Apostolic School in New Hampshire. He is currently working as Vice-Rector of Sacred Heart Apostolic School in Indiana.